The Continuing Relevance of "On the Beach" - Helen Caldicott, M.D. These words mark the reaction of a young Australian named Helen Caldicott to a story of the aftermath of mistaken nuclear war, in which those who never even took sides were faced with the slow advance of deadly nuclear radiation on their shores. On the Beach, first a best-selling novel and then a major Hollywood film, confronts the viewer with a number of questions: How would you behave if—in the aftermath of a nuclear apocalypse—you knew you only have a few weeks or months left to live? Would you carouse riotously, knowing the end is near? Deny that the entire thing is happening? Hope against all logic for a miraculous reprieve? Try to maintain a core of decency in the face of imminent death? Wish that you had done something long ago to prevent nuclear war in the first place? But what about the book itself and the 1959 movie made from it? Recently, after watching a 2013 documentary called Fallout (produced by Rough Trade Pictures in association with Screen Australia and Film Victoria) that ponders these questions, I sat down with Karen Sharpe Kramer, widow of the producer-director of On the Beach. Stanley Kramer was well-known for releasing such “message” films as Judgment at Nuremberg, Inherit the Wind, and Ship of Fools. Of On the Beach he once wrote, “Its subject was as serious and compelling as any ever attempted in a motion picture—the very destruction of mankind and the entire planet.” Kramer died in 2001, but as the Iran nuclear agreement, renewed US-Russian nuclear tensions, and the 70th anniversary of the Hiroshima and Nagasaki bombings make headlines, his Eisenhower-era movie retains an unfortunate relevance. A different time—or maybe not so different. Sixty years ago, as the Cold War intensified, the end of the world seemed much too close for comfort. The threat of nuclear destruction, implicit in the newspaper headlines of the day, naturally leached into popular culture. The first filmmakers to incorporate the potential for global apocalypse into their work were the makers of low-budget horror flicks, like 1953’s The Beast from 20,000 Fathoms and 1954’s Godzilla. Such movies both shocked and titillated young audiences by positing that nuclear tests had unleashed huge, fearsome monsters that—metaphorically standing in for the Bomb itself—could not be contained. This dialogue comes from the 1959 film version. Shute’s On the Beach had quickly become a worldwide sensation. In its first six weeks, the American edition of the book sold 100,000 copies, dislodging the steamy Peyton Place from its top spot on the nation’s bestseller lists. Of course a cinematic adaptation was inevitable, and the socially aware Stanley Kramer (whose just-released prior film, The Defiant Ones, had tackled racial prejudice in the Deep South) quickly bought the movie rights. He cast major Hollywood stars in the central roles and moved his company to Melbourne to shoot one of the first feature-length Hollywood movies ever to be made on Australian soil. In this highly charged environment, a married American submarine commander (Gregory Peck), posted to Melbourne in the line of duty, is attracted to a beautiful and hedonistic local woman (Ava Gardner). Meanwhile, a young Aussie couple (Anthony Perkins and Donna Anderson) struggle with the realization that when the sickness comes, they may need to kill their infant daughter as well as themselves. As for Julian the scientist (played by an unlikely but mesmerizing Fred Astaire), he tries to cope by way of cynicism and a reckless disregard for life and limb while competing on a local speedway. In the film, the most haunting section is similarly quiet, involving the submarine’s voyage to the west coast of the United States in hopes of finding survivors. Stanley Kramer’s direction is at its best in this segment, filmed completely without sound or musical scoring. One by one, each of the crew members takes a turn looking through the periscope at a still and silent San Francisco. On the wharves, on the bridges, not a single sign of life. The intensity of this moment is matched by the film’s final shot. Kramer’s On the Beach opens with a montage of Melbourne’s lively downtown business district: pedestrians and vehicles come and go, while a sidewalk evangelist gathers a crowd under a banner that proclaims “THERE IS STILL TIME … BROTHER.” At the film’s end, after the deadly radiation has made its presence felt, the banner continues to flap in the breeze. But there’s no one to read its message of hope. The audience take-away. 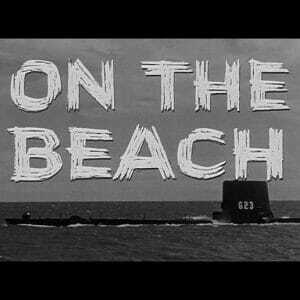 On the Beach, of course, stems from an era when nuclear weapons were primarily in the hands of two world superpowers. Today there seems to be powerful nuclear capability in virtually every global neighborhood. Which makes the message of this novel and this film all the more timely. Seven years later, Karen Sharpe came to know Stanley Kramer; they were married from 1966 until his death in 2001. The two worked together on several of Kramer’s later films, notably Guess Who’s Coming to Dinner. Still, of the entire Kramer output, On the Beach remains perhaps Karen’s favorite. She staunchly defends Kramer against the complaints made by Nevil Shute at the time of the film’s first screening. Shute had loudly protested that the film was a “bastardization” of his work because of its American cast and what he saw as the soft-peddling of the horrors of radiation sickness, which include nausea, vomiting, fever, skin and hair loss, massive ulcers, blisters, burns, emaciation, destruction of the soft tissues, bone marrow depletion, and ultimately inflammation of the membrane around the heart, leading to a slow, agonizing death. Karen also applauds her late husband for his marketing savvy. Hoping to make the greatest possible stir on the global scene, Stanley Kramer scheduled premieres of On the Beach in 18 world capitals—including Tokyo, London, Paris, Berlin, Stockholm, Caracas, and New York City—on the very same day, December 17, 1959. Heads of state attended many of the screenings, along with the movie’s stars. Ava Gardner, for instance, was dispatched to Madrid, while Gregory and Veronique Peck traveled to Moscow, where they watched the film in the company of 1,200 Soviet apparatchiks. In Australia, however, On the Beach seemed to do better. Partly this relates to the fact that the movie was made on location in Melbourne, with local sights and sounds featured on screen—always enticing to an audience. (Philip Davey has written about the excitement generated by the film’s production in his When Hollywood Came to Melbourne.) Also, On the Beach dealt explicitly with the dilemma of what the Southern Hemisphere would face if the Northern Hemisphere resorted to nuclear war. But there may have been a deeper reason, connected with the differing nature of the two countries: Australia is a land of stoics, with a fatalistic view, based upon the country’s founding as a prison colony, while (most) Americans came here willingly. The two nations have also had different histories and different experiences with their respective vast, untamed continents—as is reflected by each country’s choice of frontier heroes. While American heroes tend to be victorious strivers who subdue the land, nearly every Australian national hero dies, from the fatal Burke and Wills expedition in the outback to Simpson at Gallipoli. We Americans like winners; the Aussies admire the beautiful loser, who retains his humanity, defiance, and sense of life, even in defeat. Consequently, the themes of On the Beach have had a special resonance down-under.